Project Assistant @ Homi Bhabha Centre for Science Education (TIFR),Mumbai. JRF/RA Position for Mammalian cell cycle regulation Project @ IIT,Bombay. Project Assistant Position @ Institute of Bioinformatics & Biotechnology (IBB), SPPU,Pune. In October 2014, the Nobel Prize in Chemistry went to three scientists for their work developing a new class of microscopes that may well transform biological research by permitting researchers to observe cellular processes as they happen. 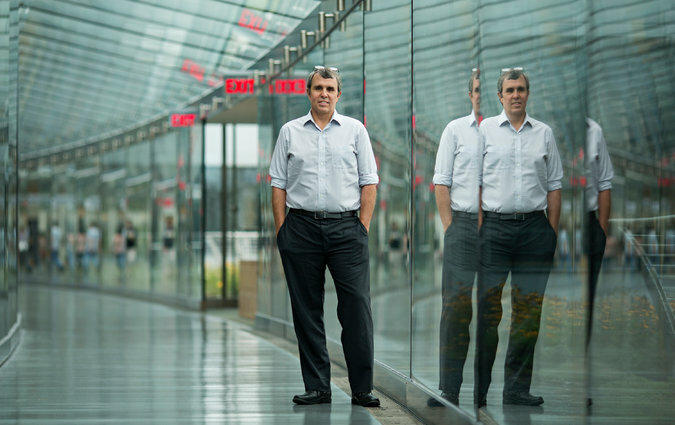 One of the winners was Eric Betzig, 55, a group leader at the Janelia Research Campus of the Howard Hughes Medical Institute. On Thursday, the journal Science published a paper by him and his colleagues describing a microscope powerful enough to observe living cells with unprecedented detail — a goal he and others have spent decades pursuing. I spoke with Dr. Betzig recently for three hours at his laboratory and office in Ashburn, Va., and again later by telephone. A condensed and edited version of the conversations follows. Q. What makes these microscopes different from those most researchers use in their laboratories today? Ans .The big problem with the standard optical microscope — that’s the one in most biology labs — is that they don’t magnify enough to see individual molecules inside a living cell. You can see a lot of detail, but it’s 100 times too coarse for single molecules. With the more sophisticated electron microscope, you can get down to the molecular level. But to do that, you have to bombard your sample with so many electrons that you essentially fry it. This means you can’t see a living process in real time. What I and others have been trying to do is create microscopes that can image the building blocks within a cell. The goal is to link the fields of molecular and cellular biology, and thus unravel the mystery of how inanimate molecules come together to create life. Are you a biologist by trade? You know, I’m not comfortable with labels. I’m trained in physics but don’t think of myself as a physicist. I have a Nobel Prize in Chemistry, but I certainly don’t know any chemistry. I work all the time with biologists, but any biology I have is skin-deep. If there is one way I characterize myself, it’s as an inventor. My father is that, too. He spent his life inventing and making tools for the automotive industry. I grew up around inventors. When did the quest to build this microscope begin for you? I started working on this in 1982 as a grad student at Cornell. By 1992, I had my own lab at Bell Laboratories. There, I built what’s called a near-field microscope that worked, to a degree. But this instrument was still too difficult, slow and damaging to samples to be useful for biological research on live tissue. I became frustrated and quit both it and Bell Labs in 1994. Shortly after that, two experiments I’d done at Bell with this machine sparked the idea that I published in 1995 and that would eventually lead to photoactivated localization microscopy — PALM — 10 years later. Ten years? Why did it take that long? Well, for one thing, I went through a very depressing period after leaving Bell. My then-wife and I had just had a baby. I stayed home as a house husband, trying to figure out what to do next. Should I go to med school? Become a gourmet chef? I didn’t have any plan except to stop making microscopes. Astonishingly, a couple of months after quitting, an insight came to me about how to make the microscope finally work. It came while I was pushing my child’s stroller. The idea involved isolating individual molecules and measuring their distance. I wrote this up in a three-page paper, which would later be noted by the Nobel Committee as one reason for giving me the prize. Funny thing about that paper: It wasn’t much cited, probably only a hundred times in 20 years. That tells you something about the value of citations as a metric of impact. For the next eight years, I worked in private industry, and I discovered it was even harder to succeed there than in science. By 2004, I was in another personal crisis, and I looked up my best friend from the old days at Bell, Harald Hess. Harald had quit Bell a few years after I did. He was now working for a company that made equipment to test disk drives and was feeling unsatisfied. So we began trying to figure things out by taking trips to Yosemite and Joshua Tree and talking about what the hell we wanted to do with our lives. I started reading up on all the developments in microscopy of the past decade. And that led to us to building, in Harald’s living room, the microscope I’d envisioned while pushing my baby’s stroller — PALM. Were you pleased with what you built? To a point. PALM had the limitations I mentioned earlier. By 2008, I became bored and frustrated with it, and started working on other types of microscopes. By then, I was at Howard Hughes and could work on anything that interested me. Here I developed the lattice light sheet microscope, which can image living cells at unprecedented speeds and often with no damage. But its resolution level wasn’t any better than that of conventional microscopes. I also worked on a highly advanced SIM microscope, which was begun by my Janelia colleague Mats Gustafsson, which would allow us to look at a sample in high resolution and at high speed. Mats occupied the office next to mine, and he was — I don’t say this lightly — one of the most brilliant people I’ve met. Unfortunately, he was diagnosed with a brain tumor after falling off his bike on the way to work in 2009, and died in 2011. When Mats died, there was still much work to be done to make his high-resolution form of SIM compatible with live imaging. After his death, I inherited much of his instrumentation and a few of his people. Since then, we’ve been working to make his higher-resolution instrument fast and noninvasive enough for live cells. We believe we’ve done it. The result is a paper published in Science. We finally have the tool to understand the cell and the dynamics of its full complexity. How has the Nobel affected your life? It’s disrupted my happy life quite a lot. I hate traveling, and you’re constantly asked to give talks. I’m in a second marriage. I have young children, ages 2 and 5. The emails, the travel have kept me away from the two things I love the most: my family and my work. However, this is a problem of my own making. I’m learning to say “no” more often. Greasing the wheels of information transfer in cells : NCBS (Bangalore), Babraham Institute (Cambridge, UK) and University College London (UK). Mealtimes at a café, a darshini or a dhaba are visible and audible scenes of seeming chaos. However, the storm of shouted orders and responses are actually a pretty good communication system that co-ordinate the serving of food from kitchens, removal of used cutlery and resetting of tables. The interior of a cell is much like a busy eatery in that it also needs seamless information exchange between its various parts – the nucleus that issues orders, the protein manufacturing ribosomes, the lipid factories of the endoplasmic reticulum and the plasma membrane that co-ordinates signalling between the cell and its environment. New insights into the communication systems within cells have been provided by a group of scientists from the National Centre for Biological Sciences (NCBS, Bangalore), Babraham Institute (Cambridge, UK) and University College London (UK). Their work has uncovered a key factor in the communication network between the plasma membrane and the endoplasmic reticulum – one that is essential in resetting the chemical composition of the plasma membrane after a bout of signalling. The researchers used fruit flies as a model system to investigate the role of a protein named “RDGBα” in maintaining the signalling networks of the plasma membrane within the light sensitive cells of the eyes. The streams of chemical reactions that occur when light falls on the light sensitive cells or photoreceptors in an eye alter the chemical properties of the plasma membrane. This occurs due to a sequence of events – referred to as the phosphatidylinositol or PI cycle – that occurs in the cell membrane in many other instances. For example, when neurons in the brain adjust their response to stimulation or the cells in our body respond to rising blood sugar after a meal, the PI cycle is set in motion. In all of these settings, a lipid component of the cell membrane, named phosphatidylinositol bisphosphate (PtdInsP2) is broken down enzymatically to release another lipid, phosphatidic acid (PtdOH) as a byproduct. In order to maintain continued signalling, the plasma membrane must restore its chemical composition by continuously replenishing PtdInsP2 and removing the PtdOH produced. The generation of PtdInsP2 depends on a lipid precursor molecule, phosphatidylinositol (PtdIns), that is produced in another distinct cellular compartment, the endoplasmic reticulum. Since PtdIns and PtdOH are lipids (which belong to the family of fats), they cannot move by simple diffusion through the watery interior of the cell. So, how does the plasma membrane replenish its PtdIns supply and remove the excess PtdOH to maintain homeostasis during this signalling process? The answer to this lies in the protein RDGBα (retinal degeneration B), which aids in maintaining the chemical integrity and function of the plasma membrane. Fruit flies without RDGBα function have photoreceptors that are defective in responding to light and undergo retinal degeneration on continued exposure to light. Investigations revealed that RDGBα can act as a shuttle moving PtdIns and PtdOH between membranes and this function of the protein is critical for normal photoreceptor structure and function. One of the salient points about this piece of research is the essential meshing of in vitro biochemistry, cell biology and functional analysis in an intact organism to understand the role of a single protein in supporting plasma membrane properties. Dr. Padinjat Raghu, one of the corresponding authors of the paper states that although previous studies have looked at the function of RDGBα as biochemical reactions in vitro, none have related the outcome of these reductionist analyses to the function of the protein within the complex and crowded confines of a living cell. “There has been considerable interest in the sequencing of the human genome and unravelling how encoded genes function in in health and disease. For obvious reasons there are limitations to detailed experimental analysis in humans. A recent study on the human equivalent of RDGB in cultured cells has showed that the protein functions in a similar manner to Drosophila RDGB. Therefore, our work demonstrating the importance of this protein in intact functioning flies highlights the value of genetic models such as Drosophila in dissecting human gene function.” says Dr. Padinjat. The process under study is a widely conserved chemical reaction that helps in information transfer in animal cells, and is a part of pathways that are implicated in the mechanism of diseases such as diabetes, tumour development and neurodegeneration. This study helps in revealing how fundamental biochemical processes in cells operate and in the future may help in the developing therapeutic strategies for human or animal diseases. Shweta Yadav , Aniruddha Panda and Swarna Mathre are affiliated to the National Centre for Biological Sciences (NCBS), Bangalore. Kathryn Garner, Michelle Li, Evelyn Gomez-Espinosa and Shamshad Cockcroft are affiliated to the Department of Neuroscience, Physiology and Pharmacology, University College, London, UK. Plamen Georgiev, Max Planck Institute of Immunbiology and Epigenetics in Freiburg, Germany. Hanneke Okkenhaug, Imaging Facility, Babraham Institute, UK. Dr. Raghu Padinjat is affiliated to National Centre for Biological Sciences (NCBS), Bangalore. The paper was published in the Journal of Cell Science on the 1st of September and can be read here. Anusha Krishnan is a writer with the Research Media Services Division of Gubbi Labs. Original News Source : NCBS News. iBiology’s mission is to convey, in the form of open-access free videos, the excitement of modern biology and the process by which scientific discoveries are made. Our aim is to let you meet the leading scientists in biology, so that you can find out how they think about scientific questions and conduct their research, and can get a sense of their personalities, opinions, and perspectives. We also seek to support educators who want to incorporate materials that illustrate the process and practice of science into their curriculum. This project is made possible by the good will of many biologists who are committed to making their work broadly accessible and to conveying the excitement of biology to a worldwide audience. iBiology.org (formerly ibioseminars.org and ibiomagazine.org) was developed to bring the best biology to people throughout the world for free. Started in 2006 by University of California, San Francisco and Howard Hughes Medical Institute investigator, Professor Ron Vale, iBiology has grown to include over 300 seminars and short talks by the world’s leading scientists. Our collection includes talks by many Nobel Laureates and members of the United States National Academy of Sciences.